Riding the Axe. 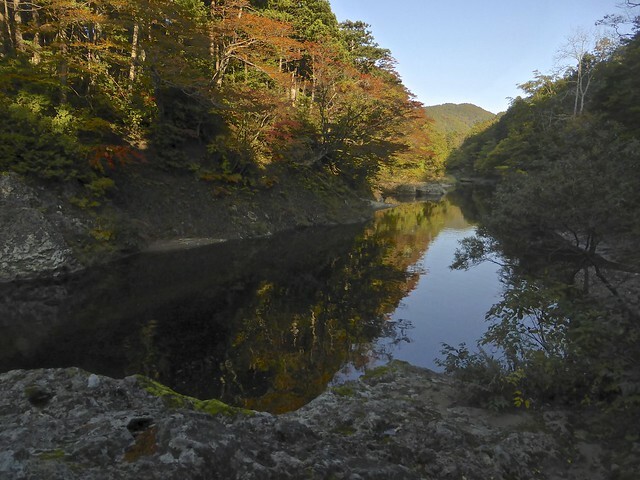 Shimokita Peninsula, Aomori. Japan has four seasons, apparently. In the autumn, it’s all about the changing colours on the trees. 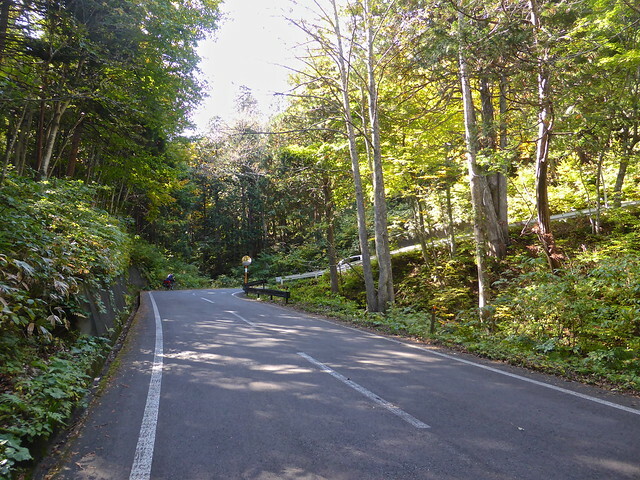 People will drive for miles to go to well known ‘Koyo’ (there’s even a specific word for it!) 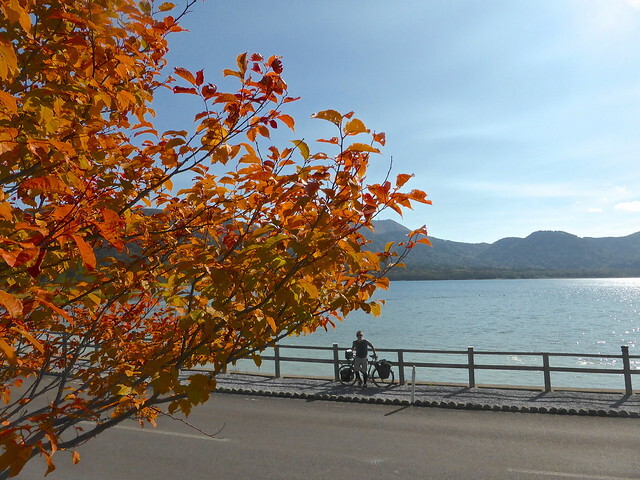 spots to observe, take photos and generally go nuts about the autumn colours. Maybe we’re getting old, or maybe we’ve been in Japan too long but, I kind of get it. The hills and valleys do look incredible in October when the leaves start to change. 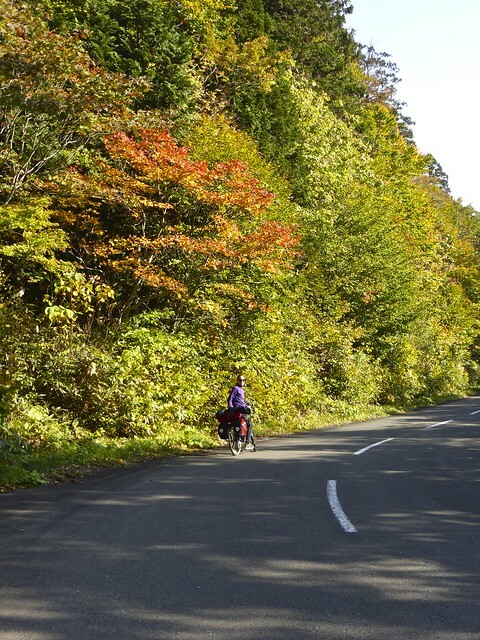 We got a good taste of ‘Koyo’ on our short cycle tour of the Shimokita Peninsula in northern Aomori Prefecture. 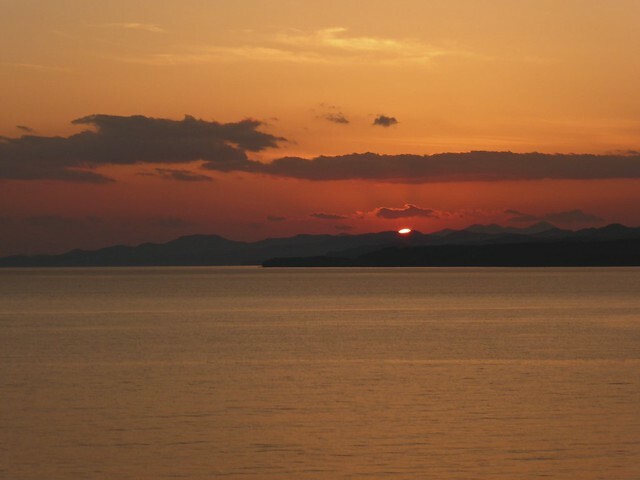 The Shimokita Peninsula is the northernmost part of the northernmost prefecture in Honshu, Japan’s main island. It’s shaped like an axe head and is very remote with no major cities and few roads. 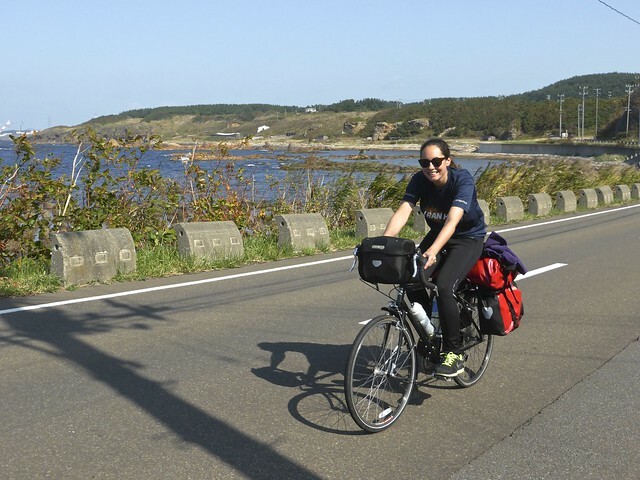 With mountains, forests, onsens and coastlines it looked like a great spot for a short cycling tour. 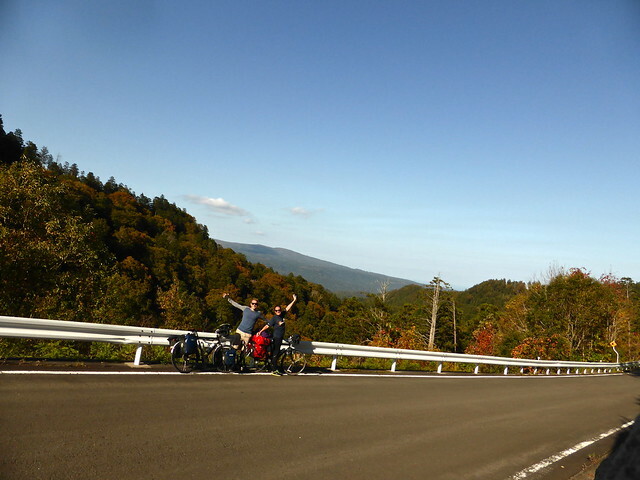 Without too much time to spare, we put our bikes in the car and drove down to Hakodate in southern Hokkaido. 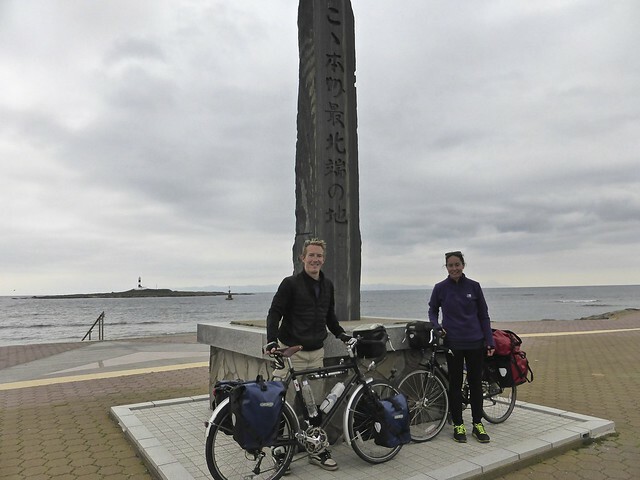 We parked up and unloaded the bikes to catch the short ferry across the Tsugaru Strait to Oma in Aomori. We didn’t hang around once the ferry docked and rode straight down the western coast road. It was immediately apparent how quiet this area is, we rarely saw another car so we were able to ride side by side for a lot of the way. We followed the road down the rocky coast through small fishing villages until we reached Sai, where we loaded up on water and then turned inland. This road took us up into the hills to cut off the bottom part of the ‘blade’ of the axe. There are supposed to be Kamoshika deer in the forests, as well as bears (which we didn’t realize at the time!) but despite lots of weird noises from the woods, we didn’t see much wildlife. 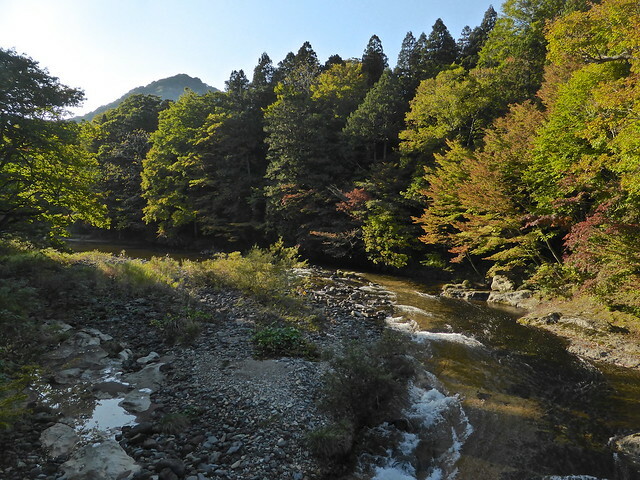 As we climbed, the colours of the leaves got more vivid, especially when they caught the sun. The road snaked its way up and over the hills until we started a big descent following a mountain river. Once we were in the shade of the valley, we were reminded that it was indeed October. The temperature really dropped and we needed to layer up for the downhill ride to the coast. 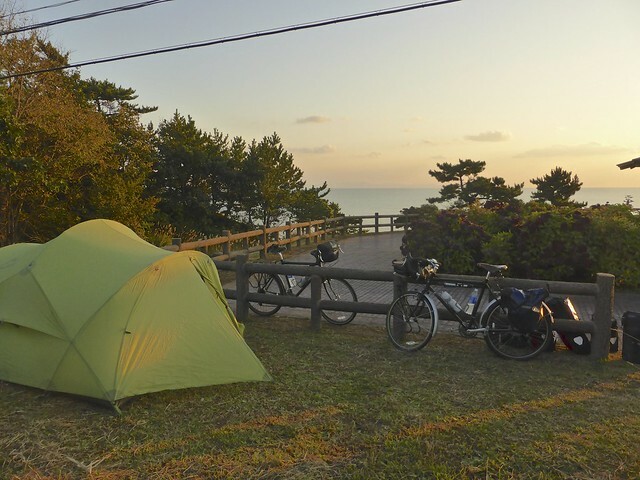 As the sun was starting to set, we found a great spot to camp overlooking the bay just east of Kawauchi. 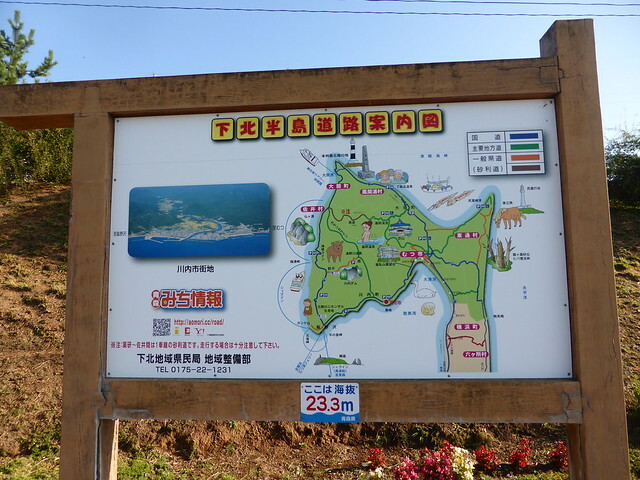 From here to Muttsu, the main town on the peninsula was a fairly uninteresting coastal road passing a few military bases. 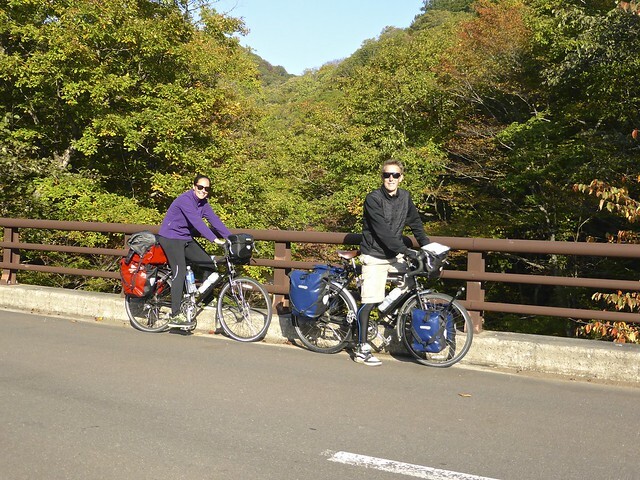 The tailwind helped us get this part of the ride over with quickly, before we started climbing again towards Osorezan, a volcanic caldera lake. The temple next to the lake, Bodai-ji is a sombre place. Known as a resting place for the souls of dead children, there are small piles of rocks built by bereaved parents dotted along the lakeside. Despite a somewhat muted atmosphere, the area is beautiful. The lake is a vivid blue thanks to the volcanic minerals and the sand surrounding the lake is a fine white powder. 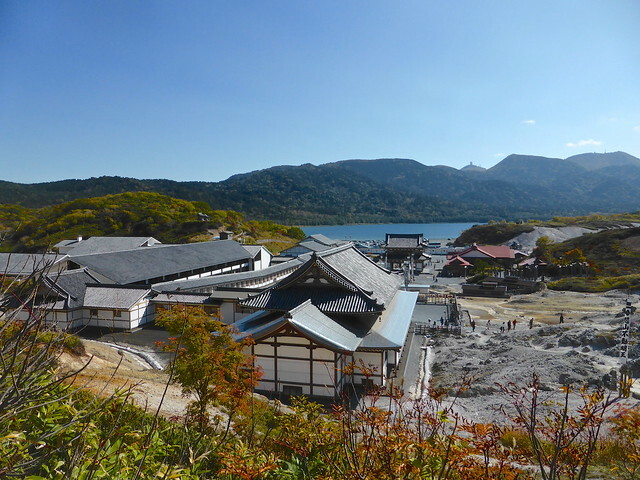 We wandered around the lake and temple for an hour or so, and then continued down into the Yagen Valley. 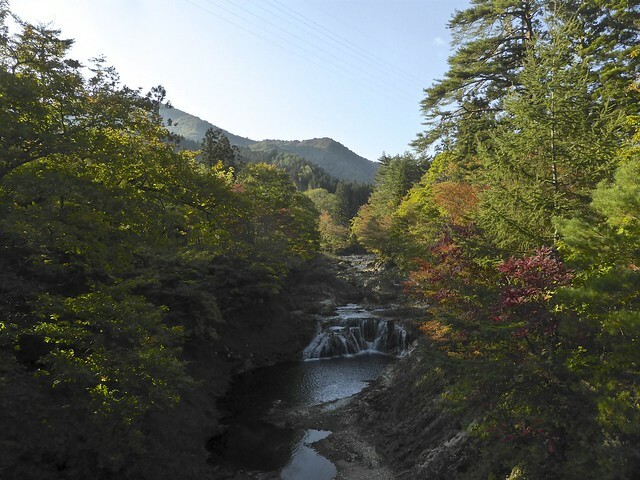 The Yagen Valley definitely deserves its reputation as a stunning place to view the autumn colours. We found a campsite and ditched our panniers, then cycled the length of the valley taking photos of the trees like proper tourists. We had hoped to get a meal somewhere in the valley, but the only restaurants were part of hotels, and for guests only. As we were dejectedly setting up our stove in the campsite, for a not very exciting dinner of pasta and packet sauce, a group of Americans called us over to their camp. 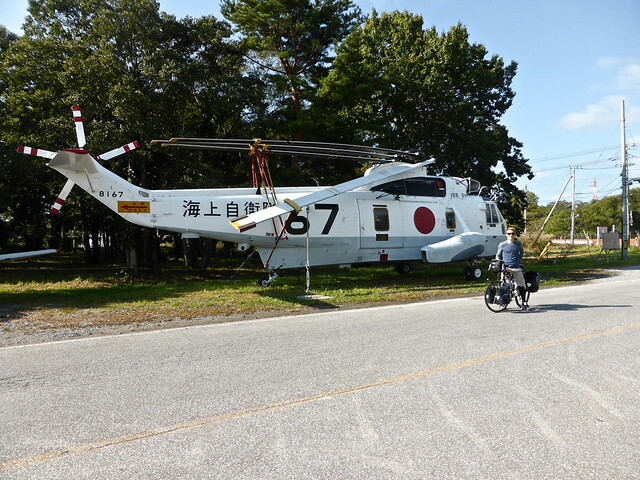 They were in the military, from the large American base at nearby Misawa. Thanks to their generosity, we dined on steak and ribs from their barbeque, washed down with cold beer. It felt strange to be at an All American cookout in remote northern Japan, but it was a great way to round of the day! 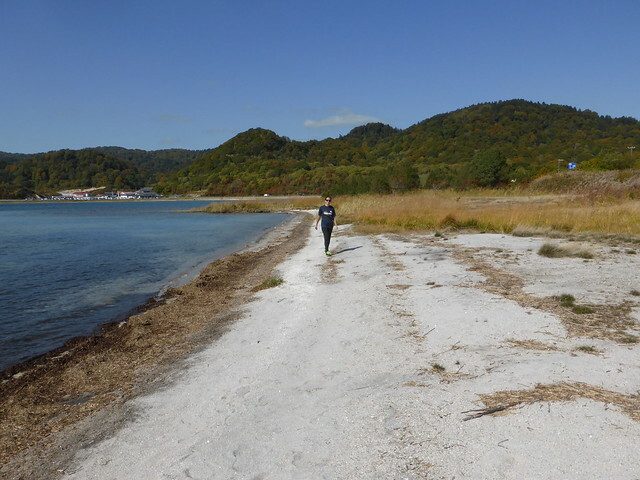 From Yagen, we travelled north to the coastline, keen to take in Oma Misaki before catching the ferry back to Hokkaido. 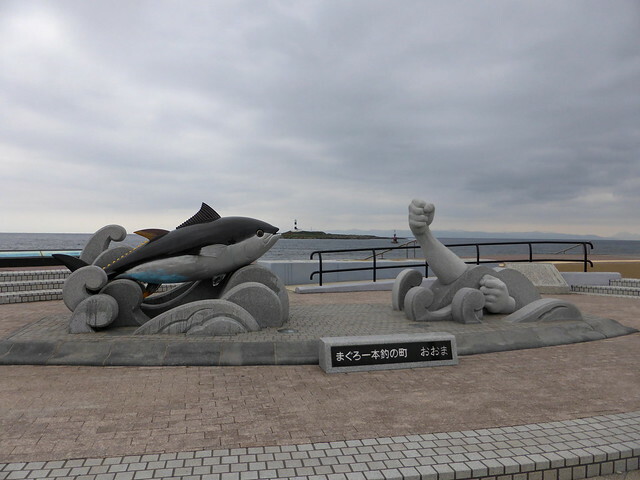 This is the northernmost cape on mainland Japan, complete with the essential monument, photo spot and tourist shops. 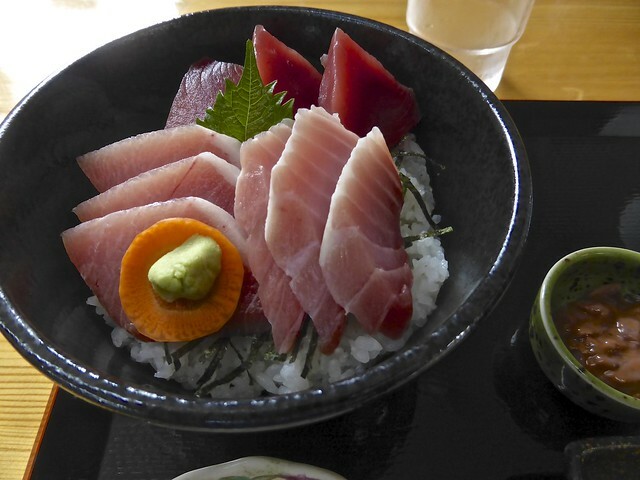 We looped back into Oma town, which is also famous for tuna fishing, so the trip wouldn’t be complete without a big bowl of tuna sushi. 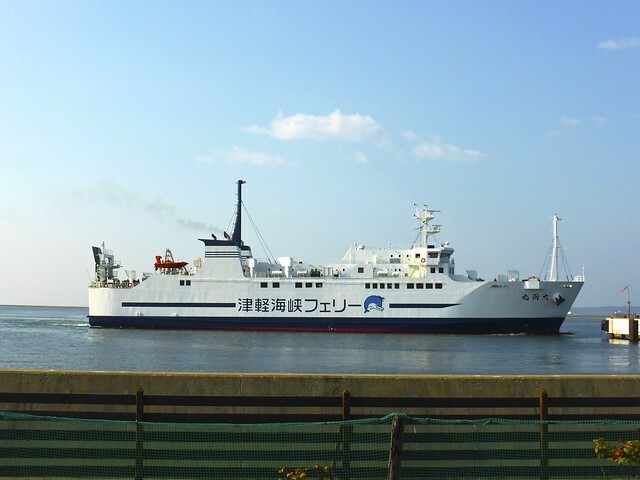 With tired legs and bellies full of raw fish, we rode onto the ferry to Hakodate where we loaded the car and headed home. So far this trip was our only taste of Northern Honshu. We’re looking forward to seeing more of it this summer.